Wow an end result to 2 days of Maths thinking! 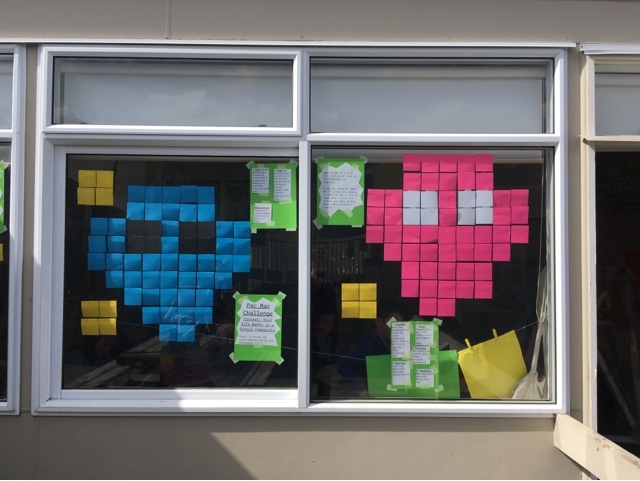 If you would like to know what our challenges were take a look at our window and see if you can solve them too! Now we are going to use our pictures to revise how to estimate, count using arrays, count in 2s, 5s, and measure perimeter and area. We are going to draw our own versions on grid paper and make our own mazes. Then we will write instructions using Rotation and Direction words. Watch this space! Wow Room 20, that looks incredible! You will have to teach us how to do that. we have some super mathematicians in Room 13 who would LOVE to do that!!! Well done guys!!! 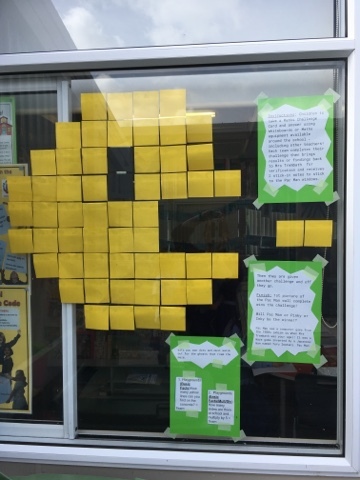 What amazing Pacman window art you have created Room 20 and I just love your maths thinking. They look awesome, can't wait to see what you do with your mazes. What a fun challenge Room 20. In fact a must try with my class! The post stick Pac Man and ghosts on your window look so cool. I wonder how many different strategies you used to count the post sticks?